“It’s mine!” said Jane Roth. She won the raffle quilt at the quilt show sponsored by Quilting-on-the-Line Guild. Fawn Grove, PA, November 18, 2013: At 3:00 p.m., when Sandy Johnson drew the winning ticket for the 2013 raffle quilt, Jane Roth was the winner. “I was just thrilled,” Jane said later. “I couldn’t believe I had won The Farmer’s Wife. It’s mine!” Ms. Roth, who lives in Pylesville, MD, had purchased the ticket to support the guild (thinking she was making a contribution). Getting the phone call was a big surprise. The Farmer’s Wife is a king-sized “sampler” quilt made from 111 different blocks pieced by guild members. 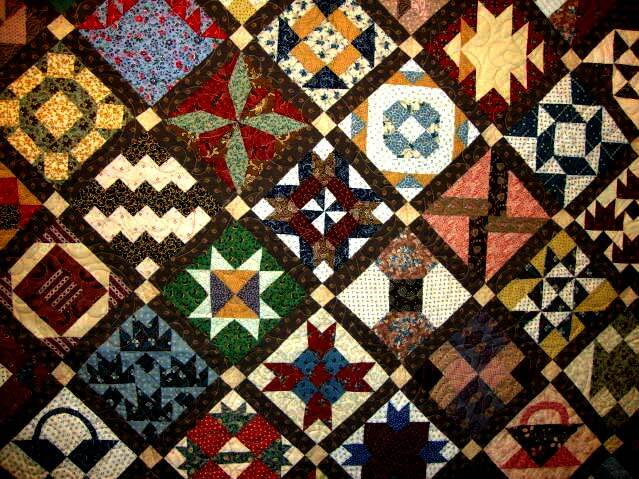 The quilt was designed by Laurie Aaron Hird and machine-quilted by guild member Karen Davis. 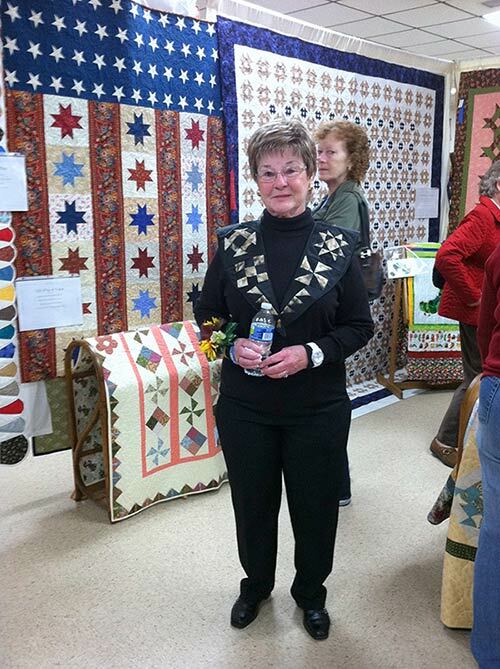 Sandy Johnson, who drew Ms. Roth’s winning ticket, was the Featured Quilter of the 2013 quilt show. As viewers admired the quilts on display, they had the opportunity to vote on their favorites. 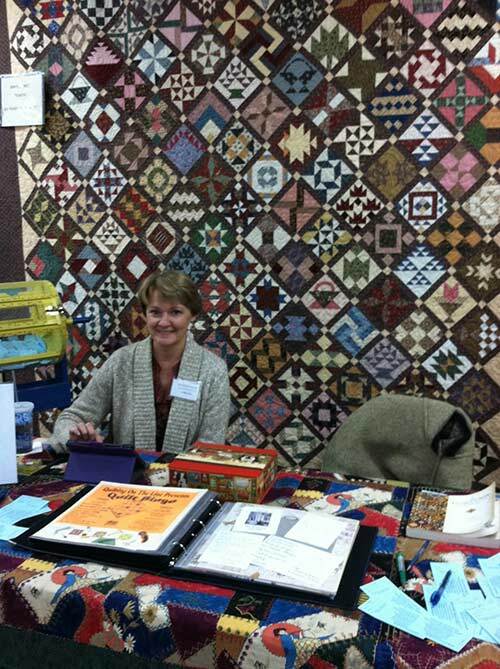 The 2013 quilt show, “Quilting Tomorrow’s Treasures”, ended on November 3rd, after a record attendance. For the first time in the guild’s 21-year history, the two-day show was held in Stewartstown, PA, at the Eureka Volunteer Fire Company. Each person who attended the show received a hand-crafted pin made by members Amber Gemmill and Sharon McKnight. The Fire Auxiliary provided food. Visitors shopped for gifts at vendors’ booths and the Craft Boutique; viewed demonstrations of hand-quilting, appliqué and spinning; and bid on Silent Auction items. Visitors learned about the guild’s Comfort for Kids project. For this project, guild members make baby and children’s quilts and donate them to the Lehman Center in York, PA and The Harford County Child Advocacy Center in Bel Air, MD. Visitors also learned about the nationwide project, “Quilts of Valor,” whose participants donate quilts to wounded veterans of the wars in Iraq and Afghanistan. Members from Quilting on the Line and non-members from the area have made and donated over 200 Quilts of Valor to wounded veterans. Veterans and other service organizations in the area have generously provided funds to buy batting and fabric to keep the project going. 10% of the proceeds from the Quilt Show will be donated to H.O. P. E. (Help for Oncology and Emotional Problems), a York County cancer support group with offices in New Freedom, PA. H. O. P. E. provides a variety of services to cancer patients and their families, such as wigs and hats, gas cards, books, school supplies, a food bank, support groups, volunteers to drive to appointments. All services are free and are not limited to York County. Visit http://www.hopeforcancerfamilies.org/ for more information. Remaining proceeds from the show to help finance the activities of the guild, such as educational speakers for meetings, and various community projects, and donations to community food lockers.